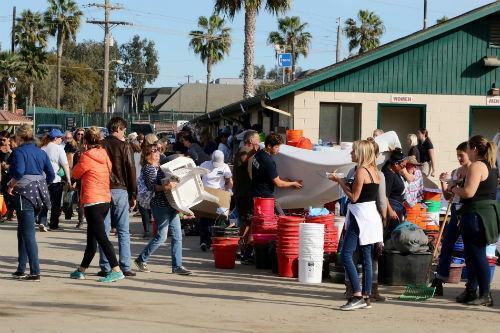 Immediately after news of the San Luis Rey Training Center fire broke, racing fans across the country were searching for ways to help the affected humans and horses. People in the area made trips to volunteer at Del Mar, while those hundreds and thousands of miles away looked for ways to send money, donations, and whatever they could. Before an official GoFundMe was established by Santa Anita Park, Del Mar, and the Stronach Group, Thoroughbred Charities of America's Horses First Fund was already in place and ready to be deployed. "It's absolutely incredible," TCA executive director Erin Crady said of the pledges and donations that have been made to the Horses First Fund so far. "LNJ Foxwoods started the Horses First Fund last year for the (abandoned) horses in Mercer County, and so far it's been used for that situation and for Puerto Rico to help the 1,000-plus horses at Camarero, which is still an ongoing situation. Now, for the California fires. It's been really great to have an emergency fund available so we can step up and help horses when they are in need." Within a couple of days, big players in the industry started adding their name to the list of those who pledged donations. Many came in the form of social media announcements, including pledges from Stonestreet, Coolmore, LNJ Foxwoods, Craig and Carrie Brogden, e5 Racing, owner and NHL player Erik Johnson, owner/breeder Vincent Colbert, among others. Horses First Fund also received more than $50,000 from a GoFundMe created by Nexus Racing Club's Sophie Shore. Crady said that while TCA doesn't have all of the pledges in yet, the organization estimates more than $100,000 was raised. "As far as the donors go, it's incredible," she said. "I'm proud to be part of this industry. The way that everyone has come together, stepped up, and offered immense amounts of help in the form of donations or products or supplies, time, talent, it's really, really inspiring." The day after the fire, TCA identified the primary needs and, through the assistance of its board member Bing Bush at Del Mar, purchased supplies from the nearby Mary's Tack & Feed with some of the funds raised. Hay, shavings, and veterinary supplies were also sent to Trifecta Equine Athletic Center, which housed displaced horses from San Luis Rey. As the needs shifted toward helping backstretch workers who lost everything, clothing and other human supplies were purchased. Now the TCA is working with track representatives and the Race Track Chaplaincy of California's Mark Dunn to identify current needs, and will be cautious of not duplicating efforts going forward. In addition to aid, Crady said local aftercare organizations may have to prepare for an influx of retiring horses. "There are probably horses affected by the fires that need an earlier than expected retirement," she said. "I haven't had any discussions with our grant recipients in California yet, but I think that's something that we'll have to address in the near future." Less than three months ago, TCA was in a similar, yet different, position of stepping up to the plate with the Horses First Fund when Hurricane Maria hit Puerto Rico Sept. 20, turning the lives of the 3.4 million American citizens and thousands of horses upside down. With the Fund, TCA shipped feed and veterinary supplies to the island to help hundreds of Thoroughbreds at Hipódromo Camarero. "We've tried to transition the efforts to the local vendors in Puerto Rico. The Jockey Club has set up a local account with some of the hay and shaving vendors in Puerto Rico, so we can assist in galvanizing the local economy but still aid the horses at the race track," Crady said of the ongoing efforts in Puerto Rico, adding that infrastructure issues at the track and citizens not having electricity are still major issues facing the island. "Someone asked me, 'How do you compare the two disasters?' And you can't, they are completely different," she said. "In California we didn't have to worry about flying supplies in because everything was available... There's really no comparison of the two disasters. Puerto Rico is ongoing." 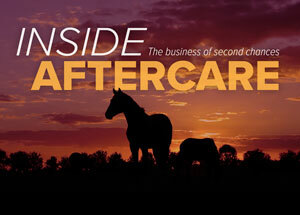 It's hard to be ready for the unexpected, but with the Horses First Fund, at least the racing industry is more prepared when disaster strikes.